“How much does 'CGPA' actually matter?”, “How do I apply online? The web portal is quite a complex one!”, “Which major is my favourite company looking for?”- These are some of the common questions striking inquisitive minds of university goer's, whether a fresher or a student in his last term. 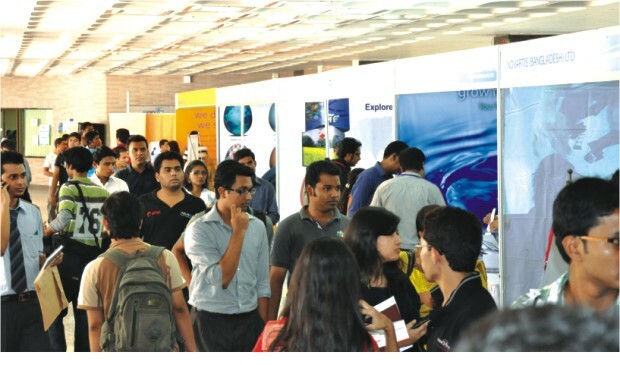 The two-day long 7th National Career Fair (NCF), 2011, held on North South University (NSU) premises from May 28-29, was an outstanding initiative to facilitate students all over the country with answer the students' queries. With the slogan, “Shape your career, help build the nation”, the career fair was organised by the Department of Career and Professional Development Services (CPDS) of NSU. Professor A K Azad Chowdhury, Chairman, University Grants Commission of Bangladesh, inaugurated the fair as the chief guest. Azim Uddin, Chairman, Board of Trustees, NSU was present as the special guest and Professor Hafiz G A Siddique, Vice Chancellor, NSU presided over the inauguration session. 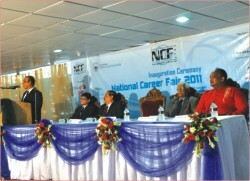 Dr Abdul Hannan Chowdhury, Dean, School of Business and Chair, Executive Committee 7th NCF, 2011 delivered his welcome speech in the opening session of the fair. About 70 reputed companies from different sectors participated in this fair, including LangkaBangla Securities, City Bank, Pertex, Maces, Robi, Nestle, Prime Bank, Citycell, Eastern Bank, ACI Limited, Novartis, Asianpaints, Philip Moris, Grow n Excel, MGH Group, Mutual Trust Bank, NCC Bank, Viyellatex, Sheltech and many more. “Please Drop Your Resume”-was a common call seen in most of the stalls. But Robi, the noted telecommunications operator with a local brand, had some different ideas. Sharmin Sultan, General Manager of HR (Human Resource), RobiAxiata Limited expressed, “We are not accepting any resumes. We have here four corners, two of which are for browsing our website and two are for counseling where anybody is free to ask queries regarding career planning. Often we get complaints like candidates facing difficulties while applying online. So our volunteers here will assist candidates in this regard. Our web portal is always updated with job opportunities available at Robi, starting from internship to top positions”. “GPIT”, a wholly owned subsidiary of Grameenphone Ltd. -the leading telecommunications operator in Bangladesh, was grabbing everyone's attention. Freshly emerged as a separate legal entity in January 2010, this private limited company was also accepting online CVs, upholding themselves as a “paperless corporation”. HasanZamil, a specialist of recruitment told that they have been receiving great response. They have maintained Grameenphone IT infrastructure for more than a decade and now are inspired to lead Bangladesh into the global IT arena. Apart from the stalls, corporate presentations of some of companies were also within the agenda of the career fair. Viyellatex, one of the pioneers of textile products in Bangladesh, presented their mission, vision, overview of the company growth, organogram, etc through a presentation. Through an interactive session they clarified the difference between “vision” and “mission” to the students. Another corporate presentation much awaited by the students was that of Grameenphone's (GP). Mahmud Hossain, Chief Corporate Affairs Officer, GP presented a PowerPoint depicting the people and the style of work at GP. He said, GP might not be young in terms of its existence in the market, but it is young in terms of its young employees. This indeed was inspiring information for the young students and fresh graduates. He also discussed some general guidelines of career planning. The stall of “Digital CV” was another attraction at the fair. It introduced the concept of audiovisual version of traditional CV which saves time for the employers and enables the candidate to show his/her expressions and overall personality. It is best suited for those interested in modeling, acting, news casting, reporting and alike. Renowned education consultants like, Canadian University Application Centre, Eduaid, TPNL were also present to provide the students with necessary information regarding postgraduate studies overseas. The stalls of radio stations were another set of charm to the fair. Alongside Radio Foorti, came a few newly emerged online radio channels like “Etune24” and “Radio circle bd” that did a live coverage of the fair. The appetite of the visitors were met with the tempting edibles at the Platinum Suits and Bellavita Pizzerria stalls. Advocate Qumrul Islam, Honourable State Minister for Law, Justice and Parliamentary Affairs was present in the closing ceremony on May 29. Professor Hafiz G A Siddique said that the career fair was a win-win situation for both the job seekers and the employers. Candidates could exhibit their potential through direct interaction with the owners and at the same time the fair served the promotional purpose of the companies.